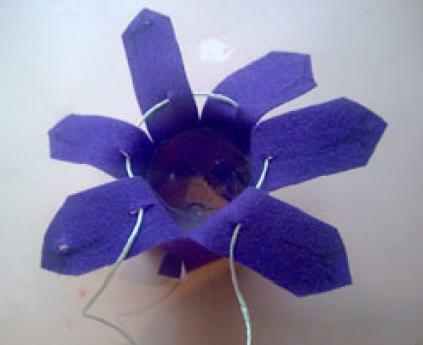 This childrens craft is very easy to make. It can be a good present for Mothers Day or can be used to keep the own jewels. Decorative elements: beads, feathers, sequins, shells, dried flowers, tapes, buttons. Ask an adult to cut the bottle 6 cm from its base. Cut a felt strip with the size of the bottles circle and 15 cm high. Bend the felt strip in 6, as in the photo. Put the cord through the holes and close the case pulling the cord. Decorate the case gluing the decorative elements that you prefer.